I have worked on a freelance basis as an artist in Arts and Gallery settings over several years. This has included working at the Whitechapel Gallery co-facilitating their access workshops for visually impaired adults and people with mobility needs. 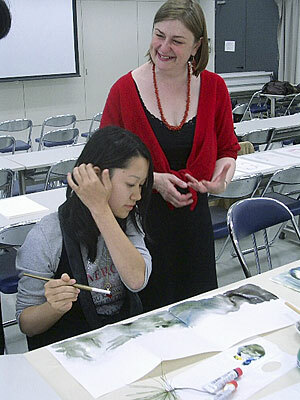 Photo of Sally working with undergraduate students at University of Art, Kyoto, Japan. Exhibitions I worked on included Carl Andre, Mark Wallanger, Inside the Visible and the Whitechapel Centenary. I co-facilitated the "Living Art" project. Artist facilitator at Milton Keynes Gallery working with visually impaired adults in conjunction with Richard Wood's exhibition. The group made their own installation and exhibition inspired by themes of the show in the project space. Participatory drawing tents at St Leonard's Festival and Wandle Festival working with 300 children and families. Drawing workshops with Merton Abbey Primary school Year 2 pupils. Drawing installation and participatory art project with the public at Liberty Festival, Trafalgar Square. Art workshop for Elephant with Visually Impaired in Camden group. "Living Art Project", Whitechapel Art Gallery. Collaborative poetry and visual arts project with poet Evlynn Sharp, working with visually impaired adults, inspired by the Rondinone and David Adjaye exhibitions, and with a poetry performance at the gallery. Workshop for Undergraduate students at University of Art, Kyoto, Japan. Workshop for visually impaired children at Fukuoka School for the Blind and Visually Impaired Adults at Museum Access View, Nara, Japan. 1995 -2005 Artist facilitator for Whitechapel Art Gallery, running participatory access workshops for visually impaired adults and people with impaired mobility. Exhibitions worked on included Mark Wallanger, Carl Andre, Inside the Visible, Tony Cragg, etc. Beatrice Tate school, Bethnal Green, working from the exhibition programme. Artist (Get Art Project) Chisenhale Art Gallery. Running art workshops for children with learning disabilities at Beatrice Tate School, Tower Hamlets in conjunction with three contemporary exhibitions in the gallery. Also worked on Get Art! Bristol with Chisenhale and Arnolfini.